The dove for this card is based on the dove from Debbie Mumm's Noah's Ark collection from pcCrafter. Using my light box, I traced the dove and wing onto white card stock. After cutting it out, I used by embossing tool to round the edges just a bit and added some distress ink for shading. I used a sponge brush and distress ink to draw the wing and tail feather details. 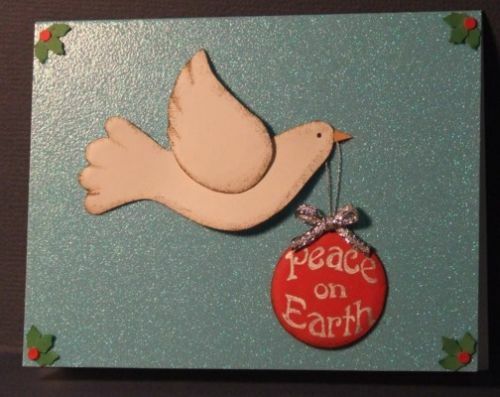 I used a silver gel pen to write "Peace on Earth" on the ornament and used my embossing tool to round the edges. I added a silver ribbon to the ornament, then mounted the dove and ornament on the card using double sided adhesive foam squares.